Angle Tower is a small, fortified manor house near the village of Angle in Pembrokeshire. It was probably built in the first half of the 14th Century. The square tower is four stories high with a round staircase tower at one corner. There was once a walled yard to the east of the tower. A stream provided a barrier on the west and south sides of the tower, there may have been a moat surrounding the entire yard. The tower is on a peninsula to the west of Angle Bay and was probably built to guard against seaborne raids. 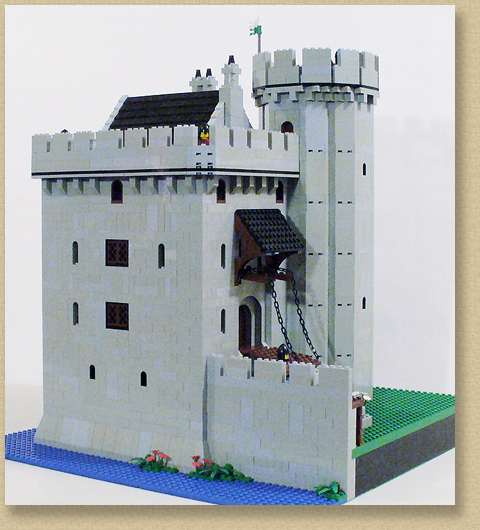 My reconstruction of the Angle Tower is 15 x 17.5 inches (48 x 56 studs) and is 18 inches high.